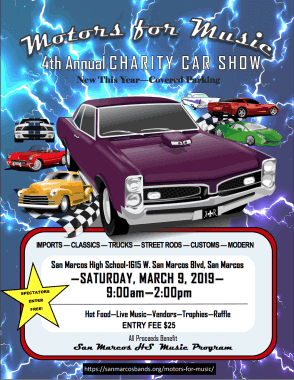 San Marcos High School presents the fourth annual: Motors for Music Charity Car Show. 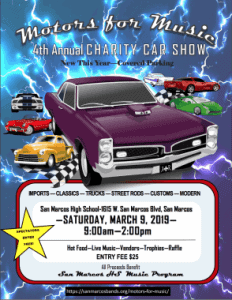 Come on out on Saturday, March 9 from 9:00am-2:00pm to enjoy food, fast cars, and fun! The Motors for Music Charity Car Show will include imports, classics, street rods, trucks, custom and modern cars to take a peek at while enjoying food and live music. Fabulous vendors will also be in attendance, as well as raffles and trophies. There is a $25 entry fee and all proceeds go to benefit the San Marcos High School music program. San Marcos music and color guard program is a transformative experience, which provides students with exceptional music, performance, and competitive opportunities. Covered parking also available. Check-in time is 7:00am, show starts at 9:00am, and awards will be presented at 1:00pm.